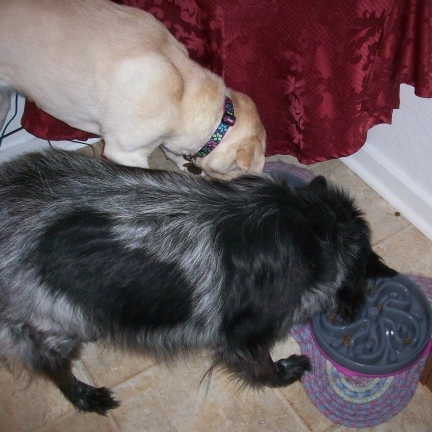 Maya and Pierson are piggy dogs. 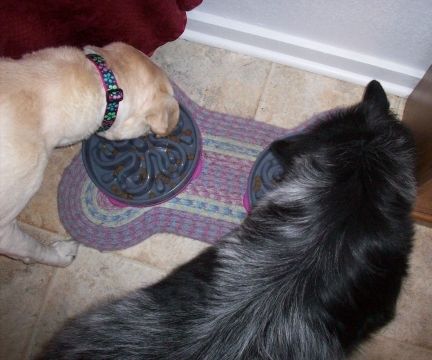 Eating from a normal bowl takes them less than a minute. 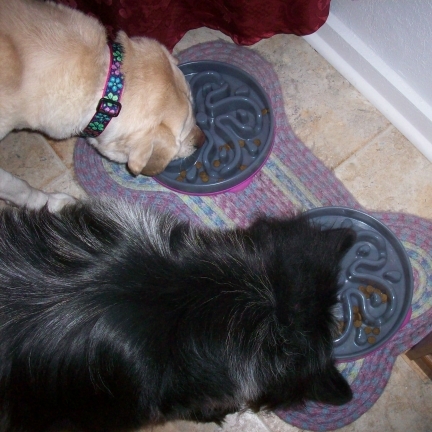 The Kyjen Slo-bowl dog bowl makes them take at least five or more minutes. I purchased these Slo-Bowl feeders on my own and am not being compensated in any way. However, if you are interested in one for your dog, follow my link to my Amazon a-store. 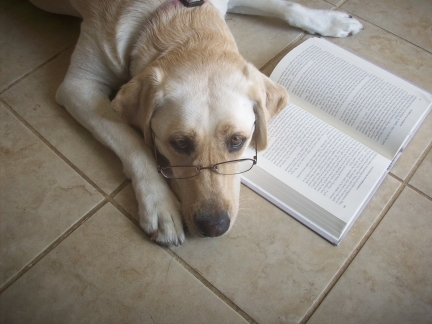 Joanne – I am writing this to heighten all dog owners awareness about dog bloat. Bloat in dogs is the second biggest killer after cancer. 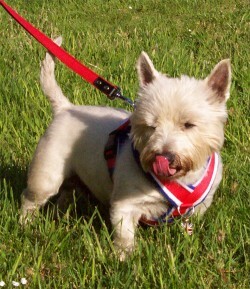 When it happened to my much loved dog Dougie, I was ignorant and totally unaware of what was happening to my poor dog. 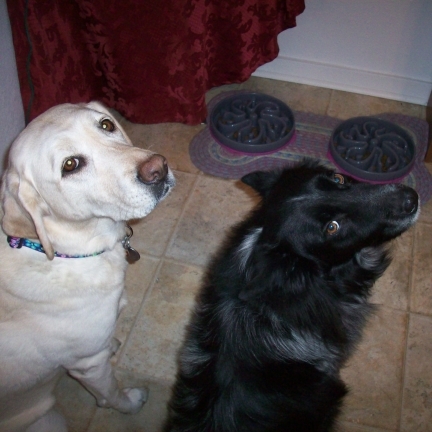 Due to my lack of awareness, my dog suffered more than he ever should have…. Every morning when I get up my dog greets me, when I go into the kitchen, with his favourite toy in his mouth – hoodie bear! It is what he lays at my feet, day in day out – his greatest treasure – that he knows I love, as I exclaim what a good boy he is and fuss over him reaching for his treat tin. 2 years ago, one morning this didn’t happen – he didn’t even get out of his basket. Worried, I went over and felt his nose which was warm. I talked to him, he wasn’t much interested, he just kept turning around in his basket restlessly but his breathing was normal. I had my coffee, I was alone, as my husband had gone to work. I kept talking to Dougie and he got up a few times and wretched but either nothing came out or just foamy white – he had done this before, so I wasn’t overly concerned. I remember thinking what he had eaten the night before and knew he had been given a largish lamb bone with quite a lot of meat on it. Suddenly I had an awful thought, usually the bone lay discarded on the floor but it was nowhere to be seen. I started to search for it frantically and went through about 20 mins anguish until I found it buried deep in his basket! Strangely this almost set my mind at rest and I just put it down to a tummy upset, whilst keeping him under close supervision. I gave him water which he lapped up eagerly and I thought this was a good sign, it wasn’t though. During the next few hours he started trying to be sick increasingly more often and paced around the room, settling here or there, then getting up again. I got really worried again and started to look for the vet’s number for advice. Whilst I was actually on the phone to the vet’s nurse, Dougie started whining, collapsed and started to crawl all hunched up to get behind the sofa – a place he had never ever previously bothered with. It was happening in front of my eyes as I described it on the phone, by this time I was frantic and starting to panic badly, with all sorts of fear going through my mind. The nurse put a vet on the phone at once and he told me to come IMMEDIATELY. I put down the phone and rushed to Dougie, dragging him out from behind the sofa where he was hunched – there was a trail of blood on the floor which had come from him and he was slumped, whining acutely now. My car was in the garage for service and I quickly googled taxi numbers and had to make 3-4 phone calls before I could find a taxi to come quick enough who was also prepared to take a dog, a very unwell dog at that. I was in a terrible blind panic between phoning and trying to keep Dougie warm and next to me. I was in tears and not coping well at all. I finally found a taxi and wrapped Dougie in a blanket and headed outside and into the car. Dougie was crying a lot and very distressed, I just held him close and talked to him all the 2 mile journey to the vets, which seemed to last forever. I was oblivious of the taxi driver and on arrival at the vets, I just leapt out of the car and gave him far too much money. The vet was waiting and immediately took Dougie from me and asked me to wait outside. I didn’t think there was much chance now and just started to pray. About 40 minutes later the vet came out and asked me to come into his consulting room, Dougie wasn’t there. I thought I knew what was coming…so started to sob whilst he told me Dougie was sedated, on a drip and needed to be kept under very close supervision for the next 24 hrs. He told me it was bloat and Dougie would have died probably died within the next 20 minutes if he hadn’t been attended to. My dog lived thankfully. If I had been aware of the main symptoms of bloat, I for sure, would have taken him to the vets sooner. I have had to make quite a few changes in Dougie’s eating and drinking habits since he contracted bloat, as his digestion process had failed – this is essentially what happens when a dog bloats. A dog who has already had bloat is more at risk of it happening again. Gulping food or water can cause bloat. Drinking large amounts of water either before or after eating can trigger it too. As part of our routine to prevent or minimise the risk of bloat we use slow feeder bowls – drink better and eat better by Alpha Paws. My Dougie is 10 now, a senior boy and I love him even more than when he was a pup!